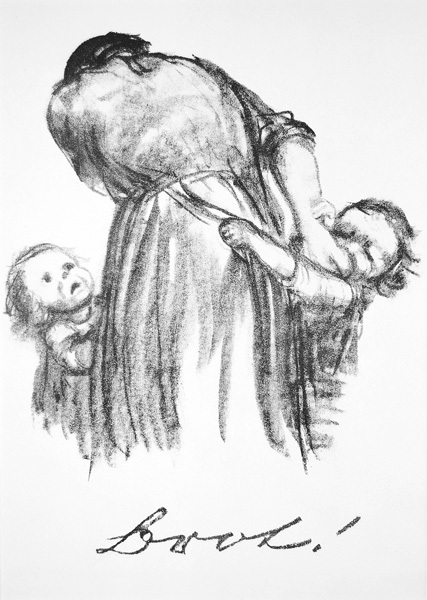 Women and children appear far less frequently in Kollwitz' work than they do in the art of such contemporaries as Mary Cassatt, Marie Laurencin, or Bethe Morisot. Yet she was a mother and the fate of children in Germany and Russia during her lifetime was one that deeply concerned her (we specify those countries because. to our knowledge, they are the only countries Kollwitz specifies in her titles). Yet surely some things are universal and eternal like the love of parents for their children, their fears for their children, and the price they willingly pay to protect their children from an often hostile world. We will explore some of those themes on this page and the next. Shwangere frau / Pregnant Woman (Klipstein 108, von Knesebeck 111.V). 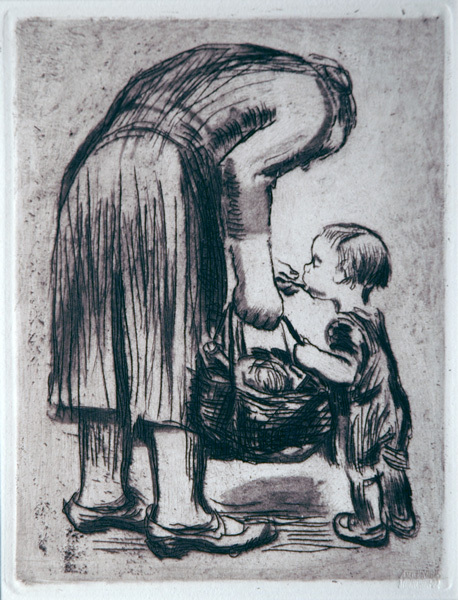 Original line etching, aquatint, drypoint and soft ground with the imprint of laid paper and Ziegler’s transfer paper, begun before September, 1910. 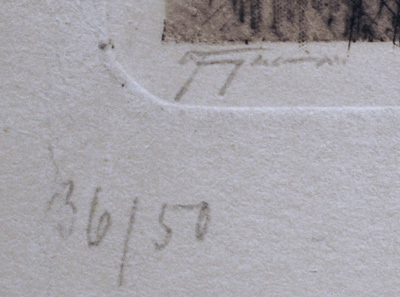 The first edition of 50 signed and numbered impressions was printed by Richter in 1920; our impression is from the 1921 Richter edition with the addition of the engraved script along the lower edge of the plate. At left: "Orig. Rad. von Käte Kollwitz. "At center: "VERLAG VON EMIL RICHTER, DRESDEN." At right: "Druck v. O. Felsing, Berlin-Chlttbg." In very dark brown which is impossible to distinguish from black ink on copperplate paper. Not signed, but occasionally with accommodatory signatures. Some proofs with Richter’s stamp of the artist’s signature and with Richter’s embossed seal. Circa 1931, the engraved script was removed for the first von der Becke edition, also in very dark brown. A very good impression with rich detail. Image size: 377x235mm. Price: $3250. Frau mit ubereinandergelegten handen / Pregnant woman with folded hands (Kl. 41 iv, AvK. 43 iv c / vii b). Original etching, 1898. 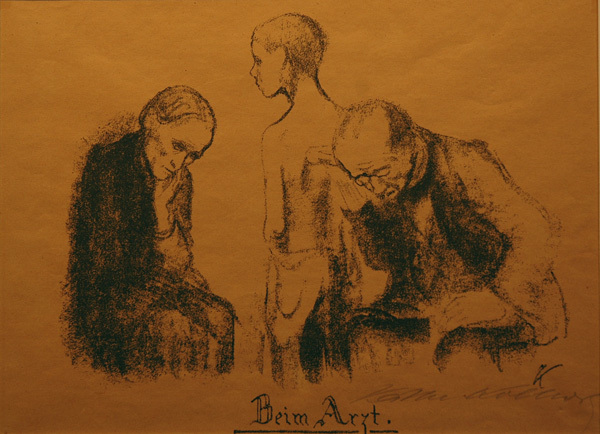 A brilliant impression of the first published edition (1918) signed by Kollwitz lower right and the printer Felsing lower left; numbered 36/50 (Knesebeck iv c: 50 numbered proofs, signed "Käthe Kollwitz" in lower right, in brown, on copperplate paper, with Felsing’s signature. Richter edition, 1918). In a 1927 study, this work, with Kollwitz's facsimile inscription, is titled "Shwangere" / Pregnant Woman. A beautiful impression with some roughness by the left platemark where the edges of the copper plate are still sharp of a quietly happy woman hands resting gently on her pregnant waist. Image size: 286x228mm. Price: $8000. Frau mit ubereinandergelegten handen / Pregnant woman with folded hands (Kl. 41 vi, AvK. 43 viib / viib). Original etching, 1898-99. From a von der Becke edition after between 1963/65 and 1972 with the publisher's 2-line Munich seal (Muenchen-22). A good clear impression on thick, soft velin paper in brown-violet ink; trimmed just outside the platemark. Paul Prouté listed an unsigned impression of the fourth state for $3000 in their Autumn 1990 catalogue. 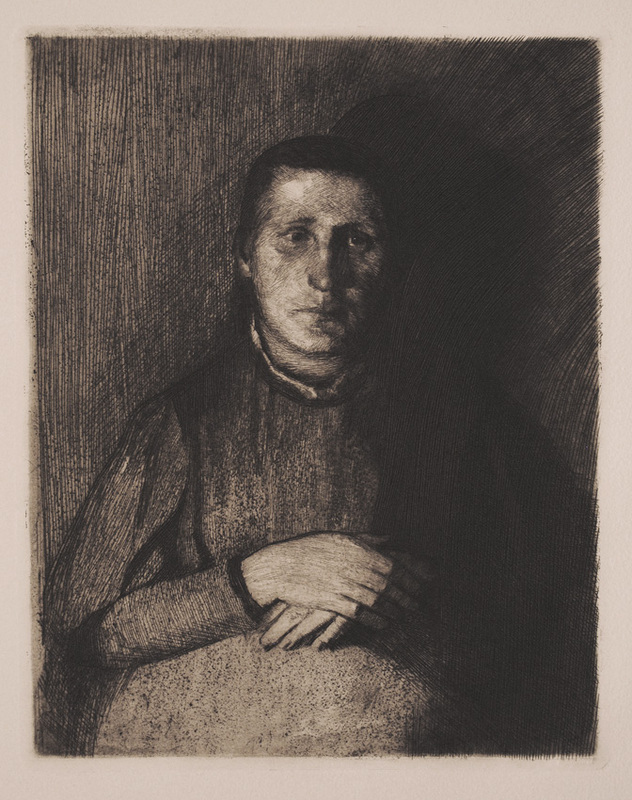 In a 1927 study, this work, with Kollwitz's facsimile inscription, is titled "Shwangere" / Pregnant Woman. Image size: 286x228mm. Price: $3000. Frau mit ubereinandergelegten handen / Pregnant woman with folded hands (Kl. 41 vi, AvK. 43 viib / viib). Original etching, 1898-99. From a von der Becke edition after between 1963/65 and 1972 with the publisher's 2-line Munich seal (Muenchen-22). A good clear impression on thick, soft velin paper in brown-violet ink; trimmed just outside the platemark. Paul Prouté listed an unsigned impression of the fourth state for $3000 in their Autumn 1990 catalogue. 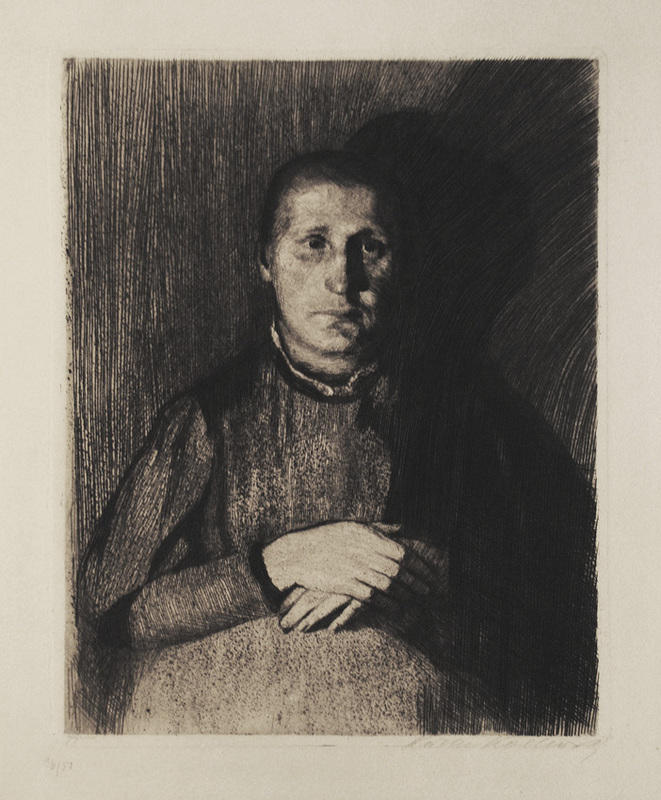 In a 1927 study, this work, with Kollwitz's facsimile inscription, is titled "Shwangere" / Pregnant Woman. Image size: 286x228mm. Price: $2850. Frau mit ubereinandergelegten handen / Pregnant woman with folded hands (Kl. 41 vi, AvK. 43 viib / viib). Original etching, 1898-99. From a von der Becke edition after between 1963/65 and 1972 with the publisher's 2-line Munich seal (Muenchen-22). A good clear impression on thick, soft velin paper in brown ink; trimmed just outside the platemark. Paul Prouté listed an unsigned impression of the fourth state for $3000 in their Autumn 1990 catalogue. 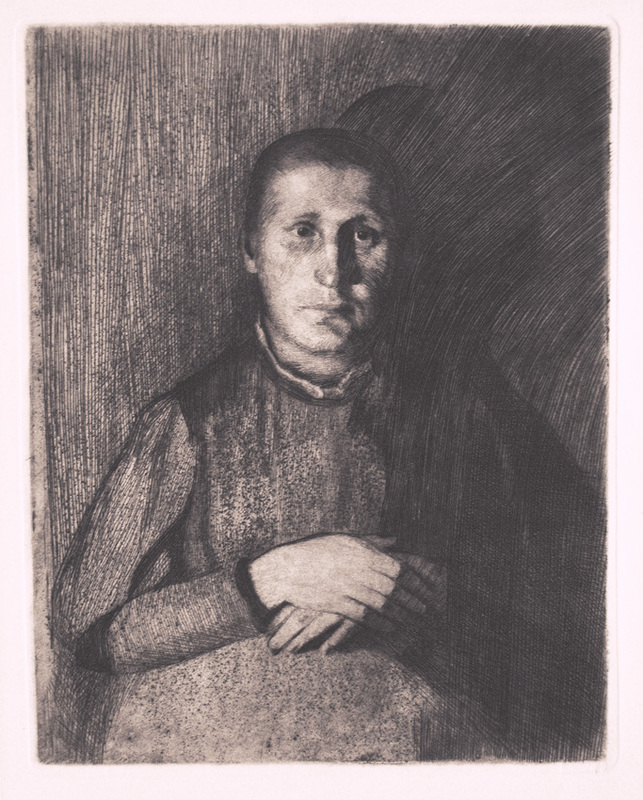 In a 1927 study, this work, with Kollwitz's facsimile inscription, is titled "Shwangere" / Pregnant Woman. Image size: 286x228mm. Price: $2450. Frau mit ubereinandergelegten handen / Pregnant woman with folded hands (Kl. 41 vi, AvK. 43 viib / viib). Original etching, 1898-99. From a von der Becke edition after between 1963/65 and 1972 with the publisher's 2-line Munich seal (Muenchen-22). A good clear impression on thick, soft velin paper in brown ink with wide margins. Paul Prouté listed an unsigned impression of the fourth state for $3000 in their Autumn 1990 catalogue. 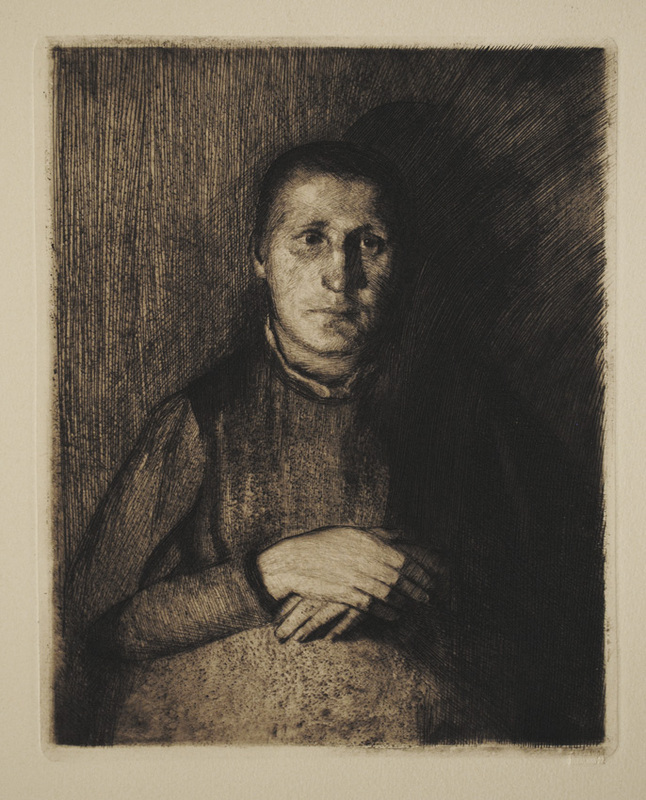 In a 1927 study, this work, with Kollwitz's facsimile inscription, is titled "Shwangere" / Pregnant Woman. Image size: 286x228mm. Price: $2250. Frau an der Wiege / Woman at a cradle (Kl. 38, Knesebeck 40 IIa/VI). Original etching, drypoint, an d sandpaper), 1897? Edition: Ours is a rare trial proof before the edition for Die graphischen Künste (Vienna, 1903) and before the engraved star on the lower plate edge. 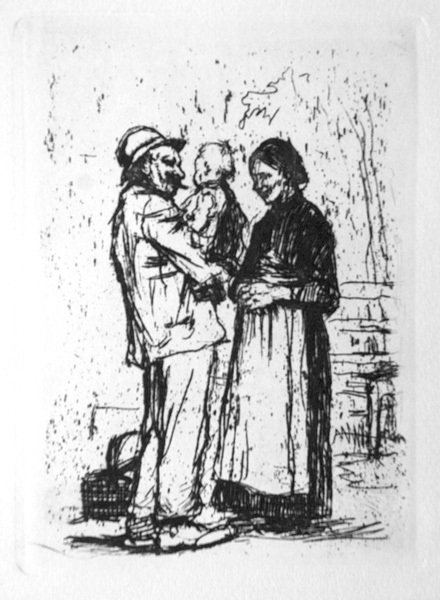 Knesebeck suggests the possibility that there might be some connecetion to the birth of Kollwitz' 2nd child in 1896. Image size: 276x146mm. Price: $2200. Mutter mit kind auf dem arm / Mother with her child in her arms (Kl. 110 iv, Knesebeck 114 V/VII d). Original etching, 1910. Edition: an unsigned impression from the edition printed by Otto Felsing. "With engraved script along the lower edge of the plate. At left: "Orig. Rad. von Käte Kollwitz". At center: "VERLAG VON EMIL RICHTER, DRESDEN". At right: "Druck v. O. Felsing, Berlin-Chlttbg." Richter edition, 1921. Proofs in brown, on copperplate paper. On illuminated areas, such as the child’s cheek, there is no plate tone. Not signed, but occasionally with accommodatory signatures." This joyful etching is one of the few that Kollwitz executed that shows people enjoying life's innocent pleasures. 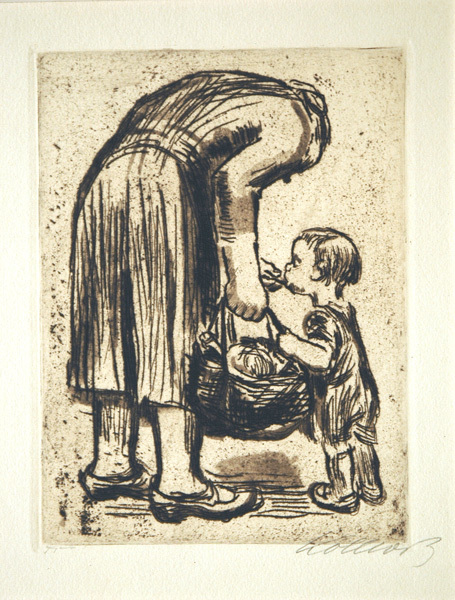 This is one of Kollwitz's most sought-after etchings. Image size: 193x131mm. Price: $2750. Mutter mit kind auf dem arm / Mother with her child in her arms (Kl. 110, Knesebeck 114 VIIc/VIId). Original etching, 1910. Editions by von der Becke between 1946/1948 and 1963/65, in brown, on various papers, among which lightly yellow or yellow-brown imitation Japan, and later on thick, soft velin, some with von der Becke’s stamp of the artist’s signature and/or von der Becke’s three-line Berlin-Halensee embossed seal (as ours). This joyful etching is one of the few that Kollwitz executed that shows people enjoying life's innocent pleasures. 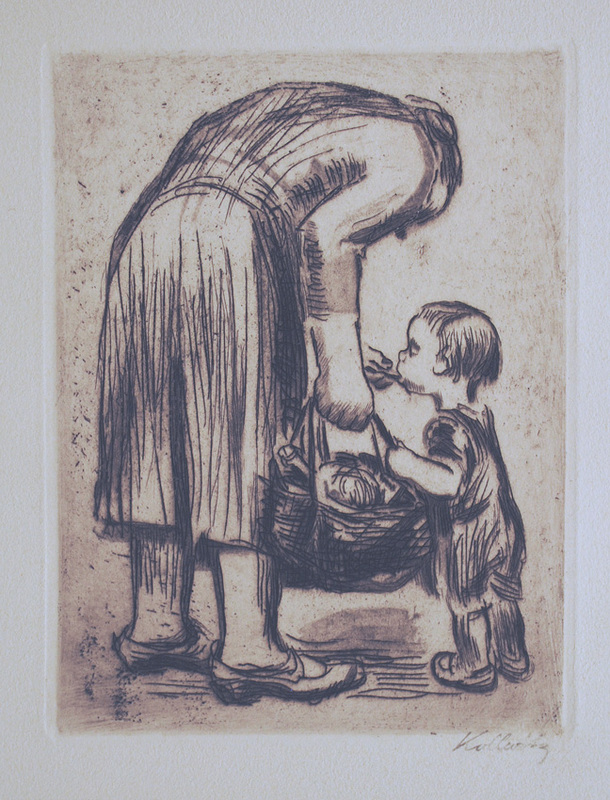 This is one of Kollwitz's most sought-after etchings. Image size: 193x131mm. Price: $1850. Bergrüssung / Welcome (Kl. 10, Knesebeck 2e / 2f). Original etching, 1892. Our impression is from the first edition published in the deluxe art review, Pan V: 1 (1899-1900). Ours is one of the 1100 impressions for the general edition with the text "KATHE KOLLWITZ, BEGRUSSUNG PAN V, / ORIGINAL RADIERUNG" in the lower left of the sheet. This joyful etching is another of the few that Kollwitz executed that shows people enjoying life's innocent pleasures. 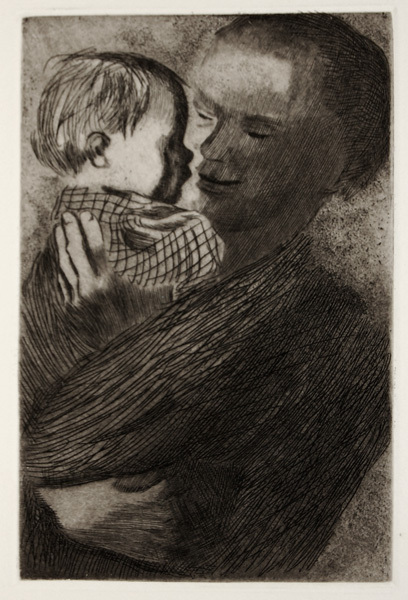 This is one of Kollwitz's most sought-after etchings. Reproduced on the cover of Chris Petteys, Dictionary of Women Artists: an international dictionary of women artists born before 1900 (Boston: G. K. Hall, 1985). Image size: 118x88mm. Price: $2500. Stehende mutter, ihr büblein fütternd / Standing mother feeding her little boy (Kl. 247iv/v, Knesebeck 242 IIIa/IVa). Original etching, 1928. Our impression (which matches Klipstein's illustration of his state iv) is crisp and sharp and seems to be a signed proof before the edition for the “Verein für Originalradierung” [Association for Original Etching] as annual premium, 1928. 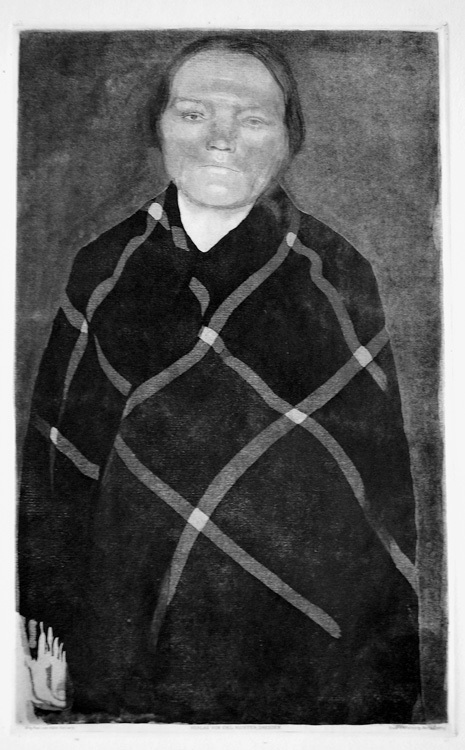 Von Knesebeck describes that state as printed in brown, on pinkish or graybrown copperplate paper, without the signature of the printer Felsing and signed “Käthe Kollwitz” in lower right. 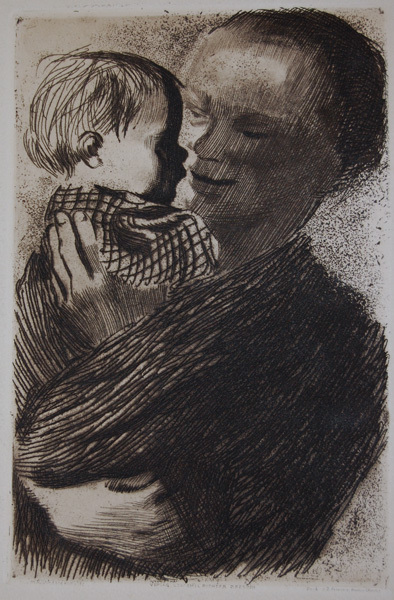 Our impression is signed "Kollwitz" lower right, printed on yellowish-cream paper, without the von der Beck drystamp and clearly earlier than the von der Beck editions, where the aquatint is mostly gone. Every line is sharp and crisp and the detail undder the aquatint is very clear. In 1933, Käthe Kollwitz (Das Neue Kollwitz-Werk, Dresden, 1933, nr. 9) titled this work "Eine Mutter füttert ihr Kind" [A Mother feeds her Child] and stated that it resulted from an "impression on the street." This late image shows a mother pausing on her way home from shopping to feed her hungry child. A spectacular impression of one of Kollwitz' most domestic images. Image size: 201x151mm. Price: $9500. Stehende mutter, ihr büblein fütternd / Standing mother feeding her little boy (Kl. 247, Knesebeck 242 IVa/IVb). Original etching, 1928. Our impression is from the von der Becke edition printed between 1946/48 and 1963/65 in brown on thick, soft velin with the publisher's 3-line Berlin-Halensee drystamp. A good bright impression with the lines still sharp and very good plate tone. This image shows a mother pausing on her way home from shopping to feed her hungry child. One of Kollwitz' most domestic images. Image size: 201x151mm. Price: $2500. Stehende mutter, ihr büblein fütternd / Standing mother feeding her little boy (Kl. 247, Knesebeck 242 IVb/IVb). Original etching, 1928. From the von der Becke edition printed between 1963-1965 in brown ink on thick, soft velin with the Kollwitz's signature stamp. 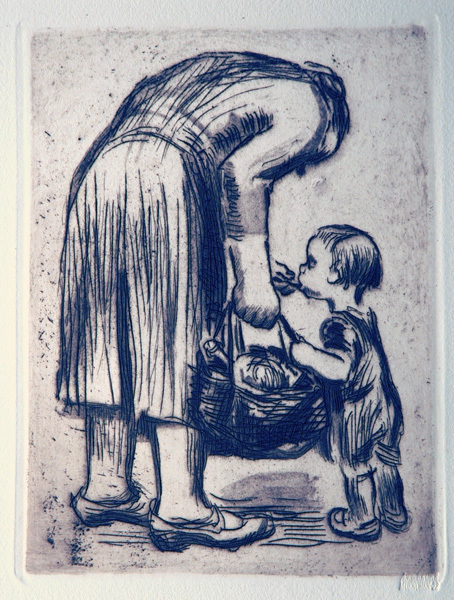 Although the photograph does not do it justice, this impression is notable for the sharpness of all the lines, especially those in the mother's dress: every line is crisp and the aquatint does not overwhelm the lines (including those in the mother's heavy shoes) despite the appearance of our photo! This image from late in her career shows a mother pausing on her way home from shopping to feed her hungry child. One of Kollwitz' most domestic images. Image size: 201x151mm. Price: $3550. Stehende mutter, ihr büblein fütternd / Standing mother feeding her little boy (Kl. 247, Knesebeck 242 IVb/IVb). Original etching, 1928. From the von der Becke edition printed between 1963-1965 in brown violet on thick, soft velin with the publisher's Munich drystamp. This late image shows a mother pausing on her way home from shopping to feed her hungry child. One of Kollwitz' most domestic images. Image size: 201x151mm. Price: $1950. Stehende mutter, ihr büblein fütternd / Standing mother feeding her little boy (Kl. 247, Knesebeck 242 IVb/IVb). Original etching, 1928. From the von der Becke edition printed between 1963-1965 in brown violet on thick, soft velin with the publisher's Munich drystamp. 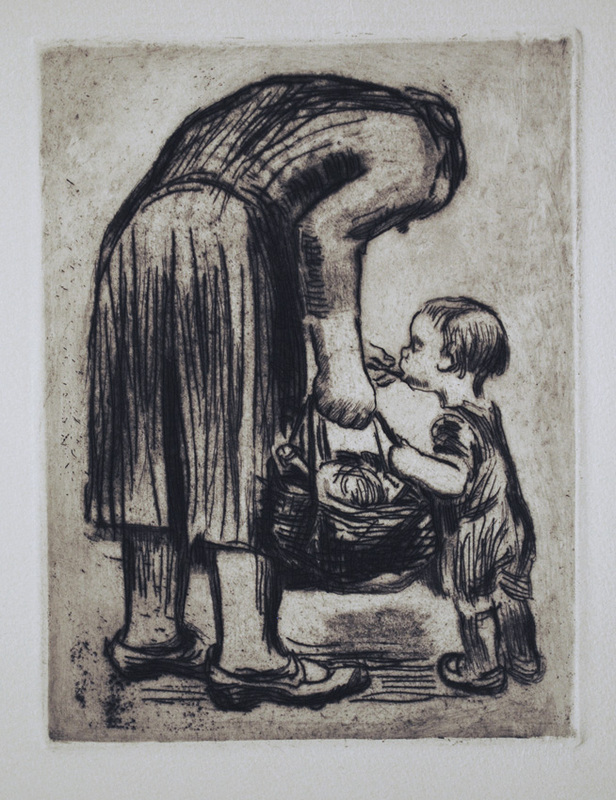 This late printing of a late image shows a mother pausing on her way home from shopping to feed her hungry child. One of Kollwitz' most domestic images. Image size: 201x151mm. Price: $1450. Mutter/ Mothers (Kl. 135 ii/ii, Knesebeck 140 II/II). Original lithograph, 1919. A good dark impression published by Von der Becke c. 1931. 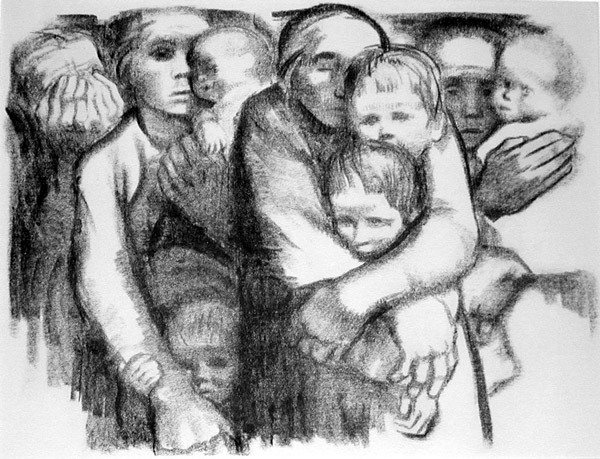 One of Kollwitz' most moving depictions of mothers trying to protect their children from the hazards of life, including (in 1919), war, civil unrest, and starvation. One of Kollwitz' richest works. 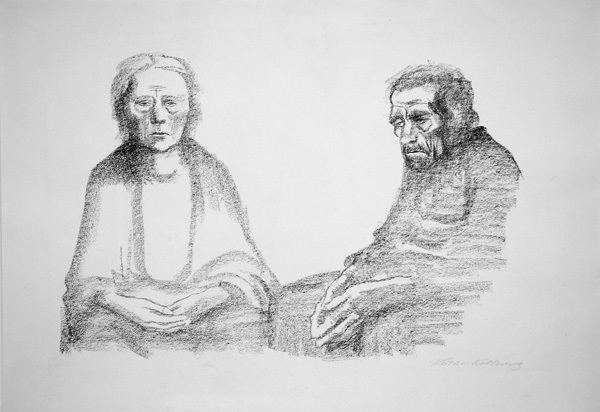 Knesebeck notes an entry Kollwitz made in her diary for 6 Feb. 1919: "I am working on Mothers. . . . I drew the mother who embraces her two children, it's me, with the children born from me, my Hans and my Peterchen. And I was able to do it well. Thank you!" Peter was killed early in World War I; Hans survived his mother. Image size: 435x585mm. Price: SOLD. Beim Artz / At the Doctor's (Kl. 150, Knesebeck 157 III/III). Original crayon lithograph, 1920. Edition: 30 signed and numbered impressions on Japon paper plus an edition on Bütten before text; 30 signed and numbered impressions on Japon paper plus an edition on Bütten and an unsigned edition on poster paper with text. Our impression is a signed impression on poster paper with the text trimmed off printed in Prussia as a large edition on thin, brown machine-made paper, occasionally signed as ours. According to a doctor who examined the image, the child is suffering from tuberculosis or "consumption," as it would then have been more commonly known. Since there was then no cure for the is highly contagious disease, the mother is hearing not simply a death sentence for her son, but probably for herself and any other children she might have. Image size: 190x253mm. Price: $5250. Deutschlands kinder hungern!/ Germany's children are starving! (Kl. 190 A.III.a.1). Original lithograph, 1924. 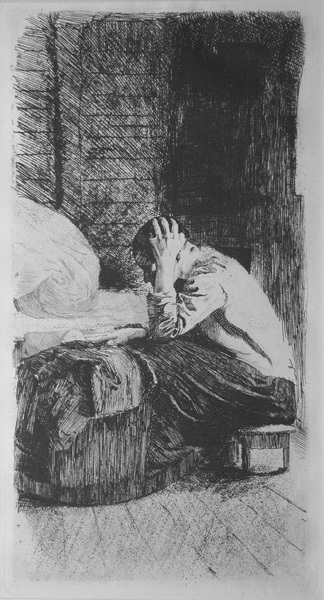 One of Kollwitz' most frequently illustrated works, this was first published as a poster then without text as here. Ours seems to be a collotype made after the stone broke of von Knesebeck's state A.II with von der Becke's 3-line embossed Berlin-Halensee seal (c. 1944-1946). Illustrated Zigrosser, pl. 48. This is one of Kollwitz' most important works and was reprinted before and after World War II with English and Norwegian texts. 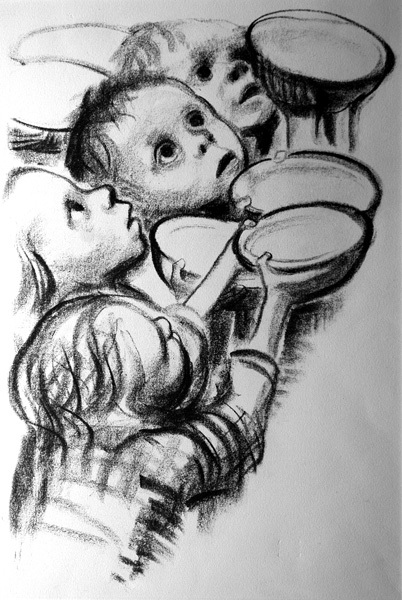 In 1931, Kollwitz wrote a friend and said, "Did you know that here in Berlin the government has undertaken a relief action to alleviate want? . . . 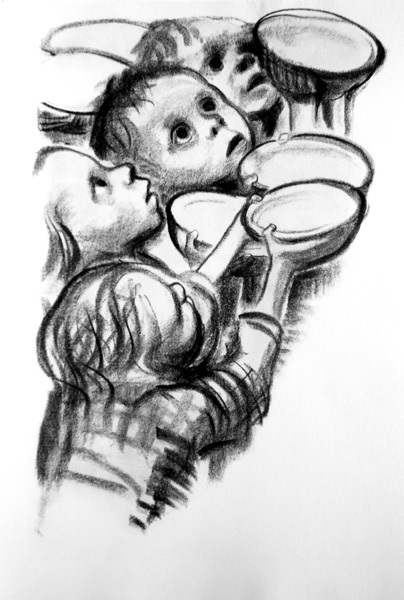 Posters showing a litho from me are appearing on advertising columns: hungry children holding their bowls high." Image size: 415x275mm. Price: $1750. Brot! / Bread! (Kl. 196, von Knesebeck 208). Original crayon lithograph, 1924. Ours is a collotype of the third state with the lithographed title but without the printed name or lithographed signature. Dimensions with lithographed title 351:280 mm. On rough, thin carton and stiff velin (as ours); some (as ours) with von der Becke’s 3-line embossed Berlin-Halensee seal (c. 1944-1946). One of Kollwitz' most important works. Image size: 351x280mm. Price: $1750. Die eltern die künstlerin / The artist's parents(Kl. 136ci). Original lithograph, 1931. 25 signed impressions on Japon paper plus 275 pencil-signed impressions (as ours) on white velin watermarked "J. W. Zanders." Fine impression on wove paper; this print has just come back from restoration and it is in very good condition. 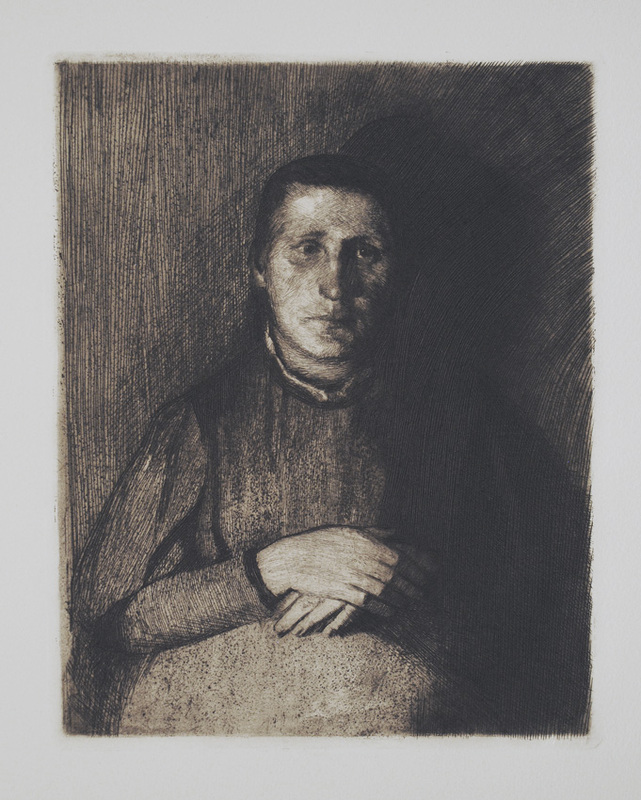 It is also one of Kollwitz' most personal lithographs. Image size: 320x480mm. Price: $8500.